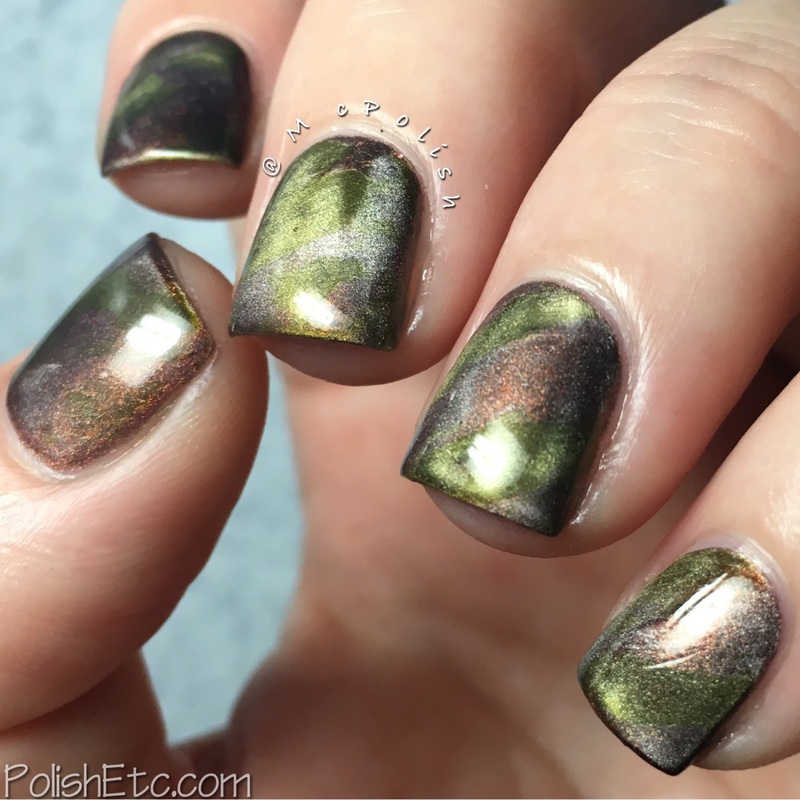 Inspired by Fashion for the #31DC2016Weekly - Polish Etc. For this week's prompt, we are doing nail art looks inspired by fashion. I am never quite sure what to do for this prompt. So I use inspiration from a specific article of clothing/jewelry? Do I go with a specific fashion trend or look? Inspired by a fashion designer? I don't know, So I went a little vague and took my inspiration from a fashion trend but put my own spin on it. Camouflage aka camo print. We see this used in military battledress, hunting gear and country fashion. I did my spin on it and added from metallic flare with magnetic polishes. I have been enamored with Masura magnetic polishes. They are so multidimensional and mesmerizing in the nail. 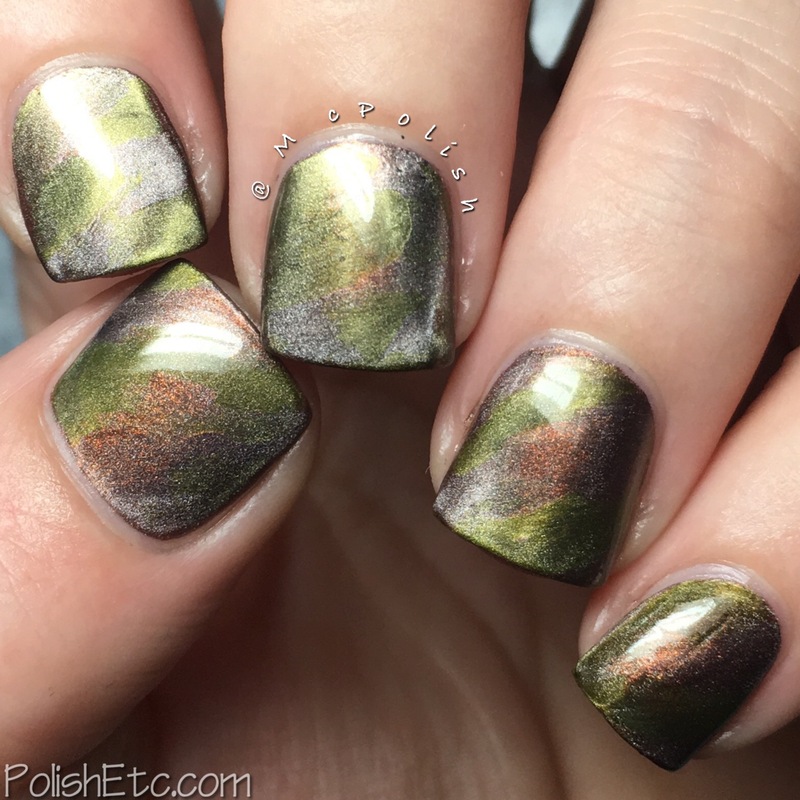 I used two colors from the Precious Stones line to create this distressed camo look and I love it how it turned out.
" and "Smokey Quartz" in a diagonal pattern across the nail. "Perfect Emerald" is a green based polish that pulls the same silver effect with the magnet. I thought these two colors worked well together for this messy metallic camo look. Before the polish dried completely, I applied a generous amount of glossy top coat and swept the super strong neodymium magnet provided by Masura over the nails one my one. I did not do this in the same pattern on every nail so they all look different. This mani look different in every angle! Sorry for the photo spam...it was just too difficult to choose a favorite shot of this mani! If you want to create a fun look like this yourself, pick up some of the Precious Stones polishes from Masura. They are out of Russia so ordering directly from their site may take a few weeks. But the wait it well worth it. You can also snag some of their polishes from international stockist sites listed on the website. Be sure to pick up a magnet along with your polishes! It is difficult to mess up. Especially with the magnet I sent you. Do it!